Yes. It would be comforting for me to pretend that the choice of which poet to feature in this instalment of Mycroft's Poetry Corner was a simple one, however, I assure you that it was not. How the pressure of this selection moved me, with incessant weighing of the existential pros versus the subjective cons of one poet over another; I declare now it was exacting an unspecified toll on my balding pate. Indeed, it is my hypothesis that the inner turmoil was increasingly manifesting itself through my interrupted sleep, my reduced appetite(s) and most worrisome of all - uncharacteristically meagre bowel-movements. This simply would not do. Therefore, when these perturbations were combined, with the acquisition by my housekeeper, of a persistent dry cough which meant that even my last refuge of an afternoon snooze was repeatedly interrupted by her hacking, I took action. I packed a moderately-sized valise and powered up my vintage Mercedes and decided to spend a number of days travelling around the South-west of Ireland. And what honest Joy! I say now that I feel I have a greater understanding of why the Germans invaded Poland & Czechoslovakia; if it was not to feel the satisfaction of putting precision-engineered machinery to its intended use, then I Sir, am a Dutchman. My love of motoring aside, the primary purpose of this brief holiday was to look at my fair country through the other end of the telescope, hopefully gaining a welcome change of perspective and to clear the maelstrom within my head. How the small coastal villages and snaking roads of West Cork and Kerry slipped by, as if in some sort of beautiful slideshow; each colourful hamlet, each grassy roadway, each sprawling Atlantic vista wound wistfully by to an aged cassette recording of Boccherini's La Musica Notturna Delle Strade Di Madrid. It is almost a cliché but the beautiful scenery of that area really hit its mark and the fresh Atlantic air did this traveller the power of good. Ironically though, despite all the cathartic scenery, it was a labyrinthine boarding house in the back-streets of Dingle that would provide the required inspiration. I had taken a small but clean room in the attic; and this unlikely "Old Maid in the Garret" was compelled to keep his wits about him at all times to avoid cracking a head on low door frames and even lower light fittings. It was after dawn on the first morning and lying in the strange gloom I was set to thinking about all the previous occupants of that room and what their lives had been like. Whose black knickers were those under the pouffe? Why was there sand at the bottom of the bin? Whose cigarette butts were clogging the lead flashing outside the window? And burying my head into the thin pillow to try for another forty winks, I could not help but laugh at the recollection of a poem where similar questions were asked and in that instant I knew I had my man - Philip Larkin. Philip Larkin was born in Coventry in 1922 to middle class parents and enjoyed a comfortable early life at the heart of little England, attending Grammar School in Coventry and later he studied English at St John's College, Oxford. He spent the majority of his working life as a University librarian, chiefly at the University of Hull. A job which afforded him ample time to write and also uniquely positioned him to watch the world and youth pass him by with a jaundiced leer. 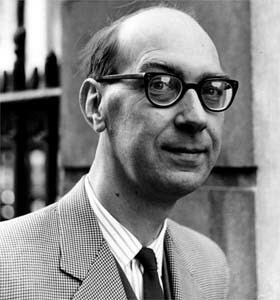 Reputed to be deeply anti-social, Larkin was still affectionately known as the "Hermit of Hull" and often imagined by his early readers as a modern-day Eeyore. In the later part of this life, he enjoyed a combination of critical success and wide public readership that other poets could only envy. However, in my opinion, the question of how a poet with such a gloomy outlook could become one of the best loved English poets of the second half of the twentieth century is still largely unanswered. A few year's after his death in 1985, the publication of his "Selected Letters" dealt a considerable blow to the reputation of the poet (and the man) when many right-wing, sexist ideals were found in much of his personal correspondence. In the eyes of the QMBC, this storm in a tea-cup does nothing to damage the man's reputation and truthfully even adds to the emotional honesty and candour of his poetry in places. I have included 3 of his poems below to give some small impression of the man's work but I invite the reader to discover more themselves. PS - A hearty congratulations to Mr & Mrs McGavin on the birth of their wee bairn - the sentiments of the final poem here almost certainly do not apply in this instance. Whose window shows a strip of building land?